In a greased 13-in. x 9-in. 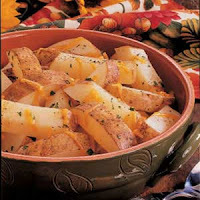 baking dish, arrange potatoes in a single layer. Pour milk over potatoes. Dot with butter; sprinkle with salt and pepper. Cover and bake at 425° for 30 minutes or until the potatoes are tender. Sprinkle with cheese and parsley. Bake, uncovered, 5 minutes longer or until cheese is melted. Yield: 4 servings.